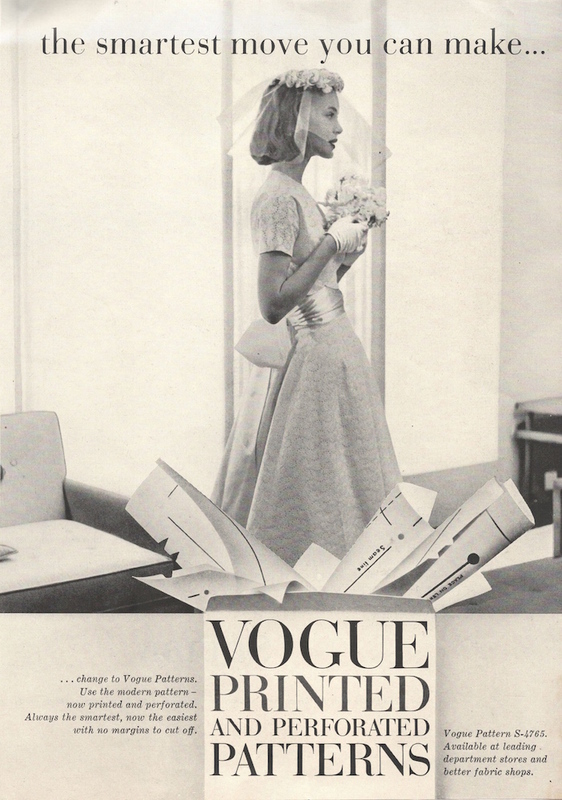 The smartest move you can make… Vogue Printed and Perforated Patterns advertisement, April 1957. The company had a series of these ads, each showing the model bursting out of a bunch of printed and perforated pattern pieces. 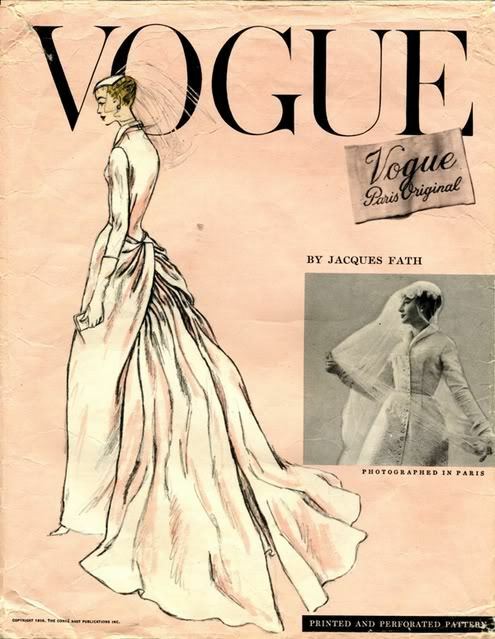 (Vogue patterns were unprinted until the mid-1950s.) I love how the slogan, “The smartest move you can make,” blurs the distinction between a life decision such as marriage and the choice of pattern brand. Queen Elizabeth II wears a Frederick Fox hat with 25 “bells” to the Silver Jubilee celebrations, 1977. Photo: Douglas Kirkland. Image: Royal Hats. Ascot begins today. 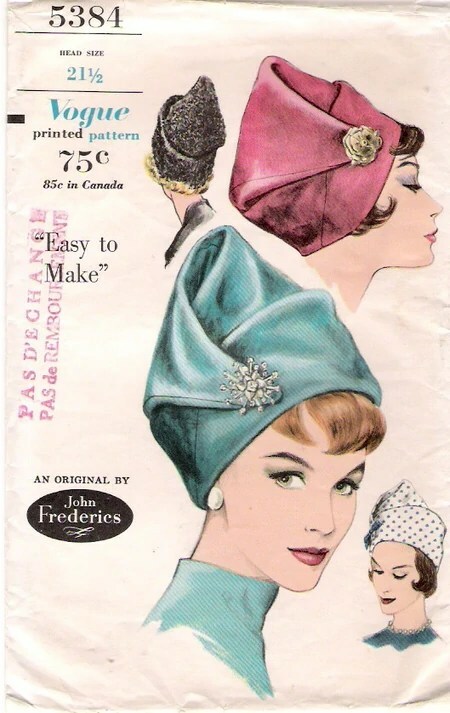 To celebrate, this post is dedicated to commercial patterns by the late milliner to the Queen, Frederick Fox. 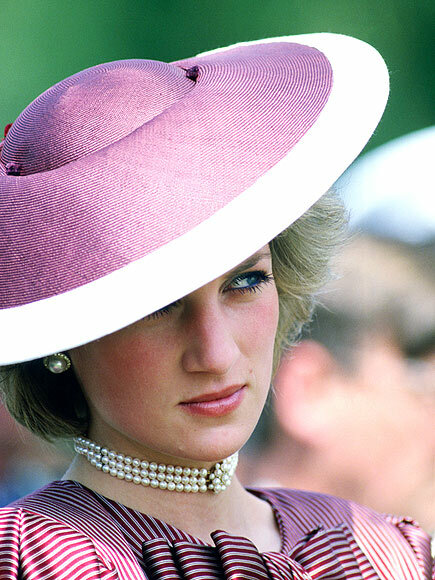 Diana, Princess of Wales wears a ‘flying saucer’ hat by Frederick Fox during the Royal Tour of Italy, 1985. Photo: Tim Graham/AP. Image: People. Born in Australia to a large family, Frederick Fox (1931-2013) showed an early interest in millinery, refashioning hats for his mother and five sisters in rural New South Wales. After training with several milliners in Sydney, in 1958 he moved to London. By 1964, Fox had taken over Langée to open his own salon. Edwina Carroll as a PanAm space stewardess in 2001: A Space Odyssey (1968). Costume by Hardy Amies; crash helmet by Frederick Fox. Image: eBay. 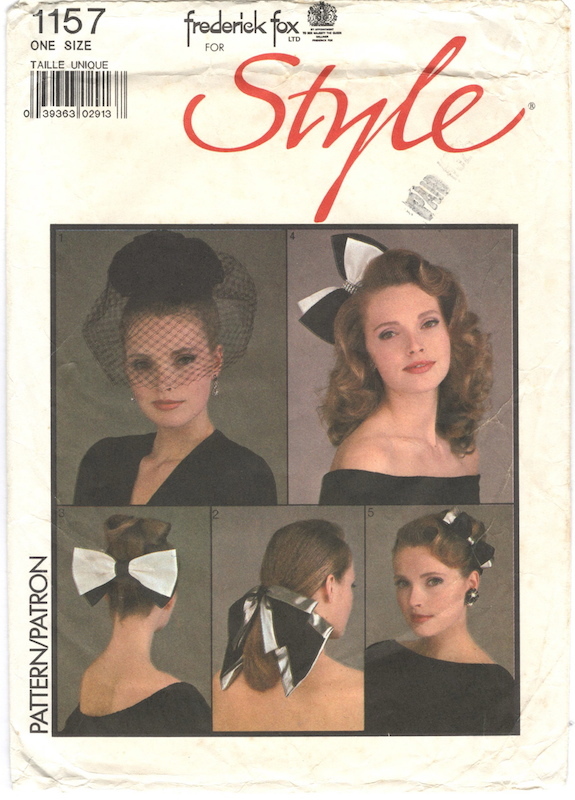 In the mid- to late 1980s, Frederick Fox millinery patterns were available from Style Patterns. Frederick Fox patterns display the Royal Warrant,* which he held from 1974 until his retirement in 2002. 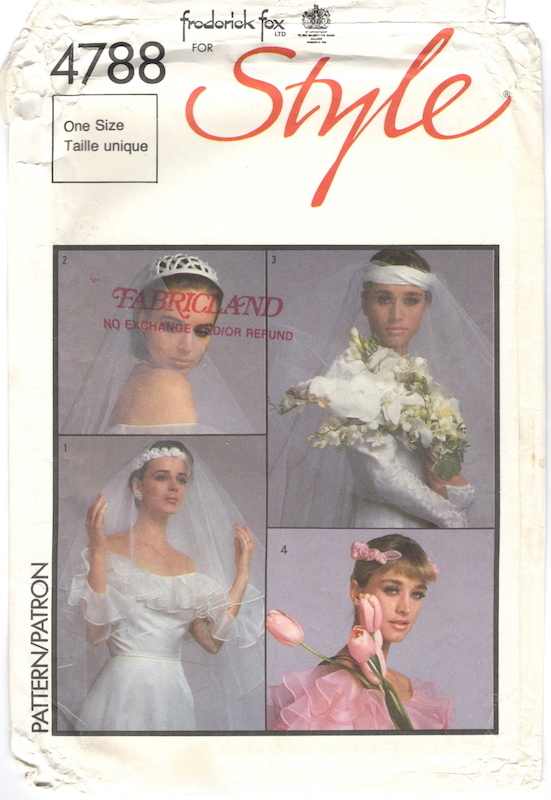 Style 4788 by Frederick Fox (1986) Bridal head-dresses and veils. 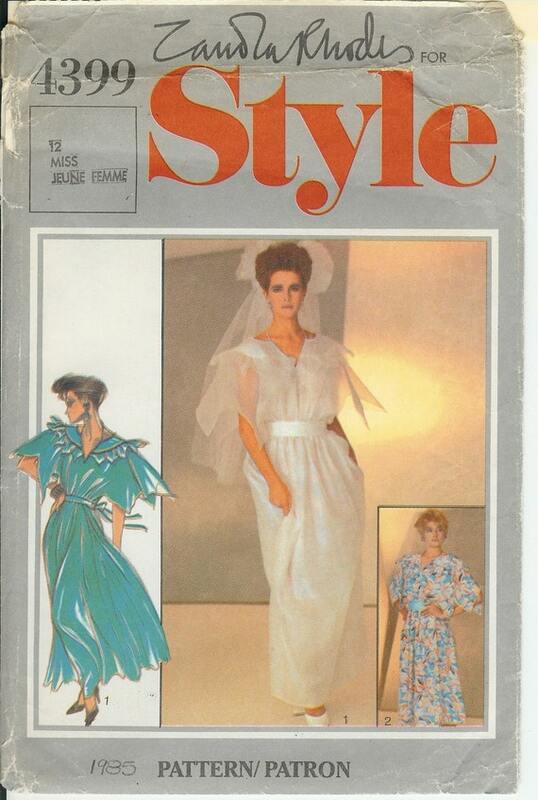 Style 1072 by Frederick Fox (c. 1986) Image: eBay. 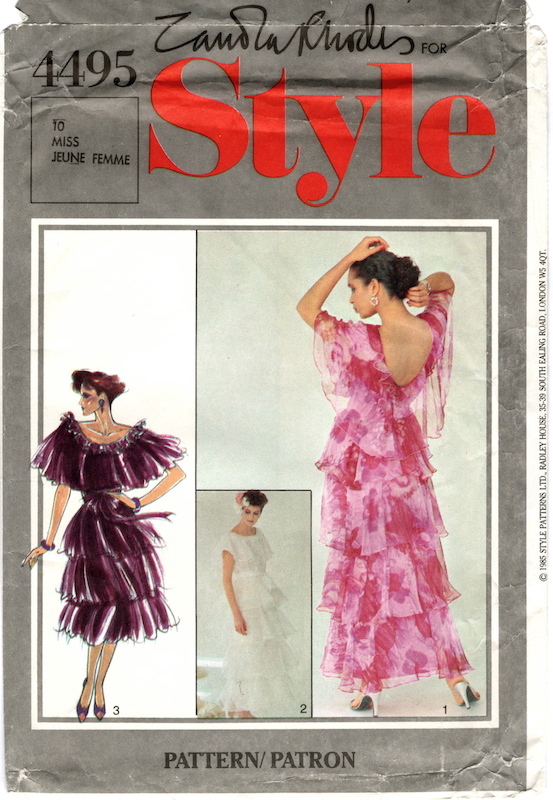 Style 1157 by Frederick Fox (1987) Hair ornaments. 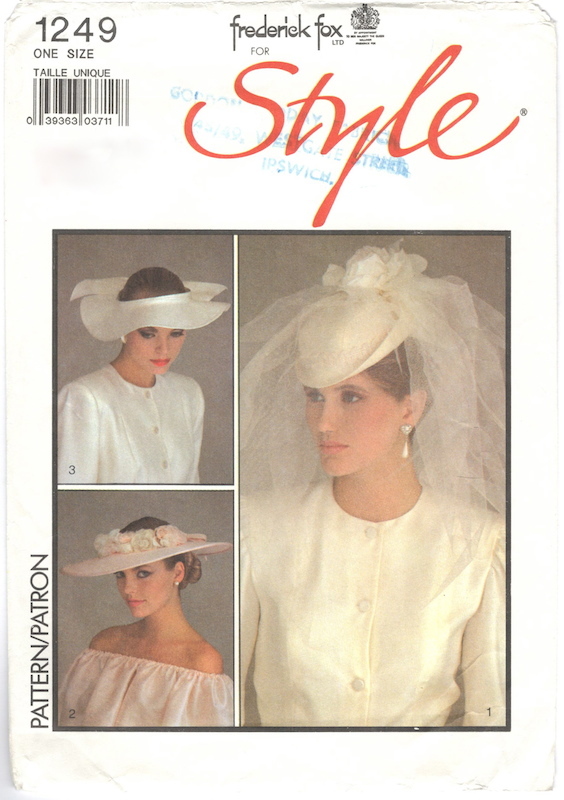 Style 1249 by Frederick Fox (1987) Bridal hats. 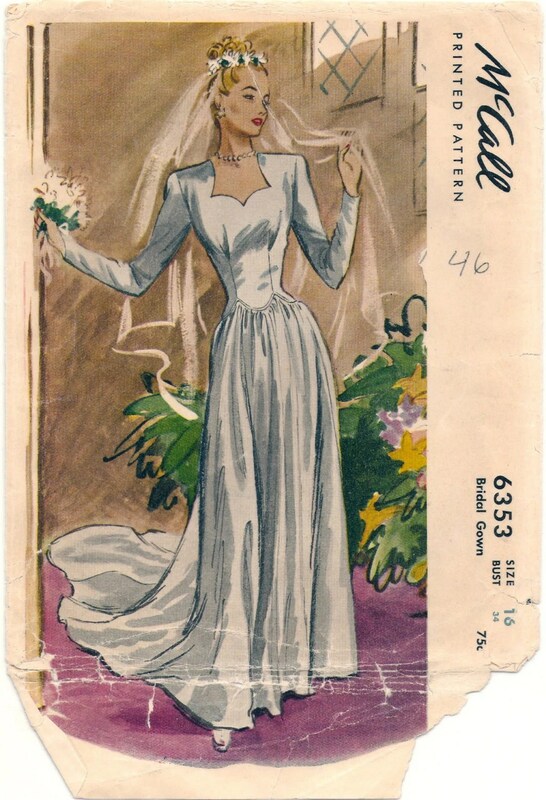 The original owner of my copy of Style 1249 had enclosed magazine pages showing these bridal designs; the text reads, “Head Turners: Hats for that special day by Frederick Fox exclusively for Style.” It may be that, like McCall’s designer patterns in the 1950s, these hats, veils, and headpieces were designed especially for Style Patterns. * The Queen’s current milliner Rachel Trevor-Morgan is the only milliner on the current list of warrant holders. McCall 9284 illustration by Blanche Rothschild, ca. June 1937. Image: PatternVault shop. 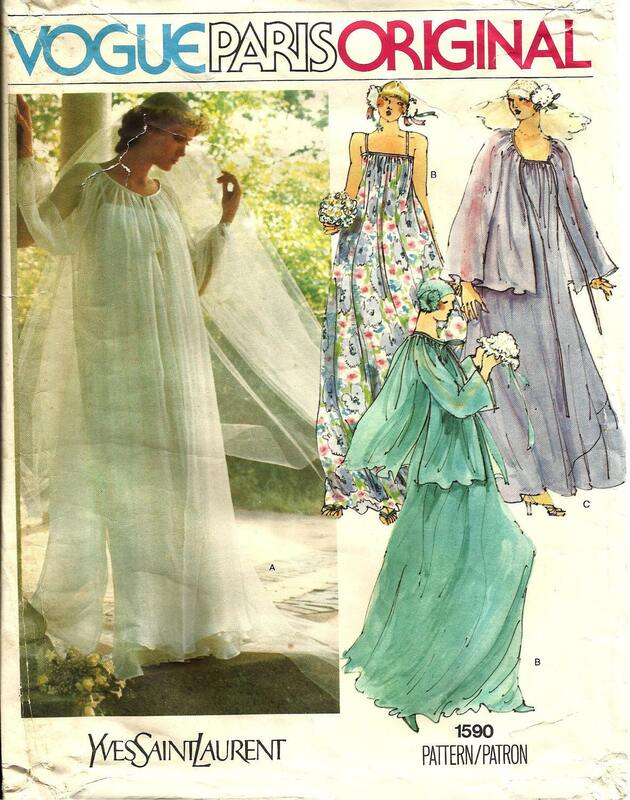 Now that wedding season is in full swing, here’s a selection of vintage bridal patterns, from the Twenties to the Eighties. 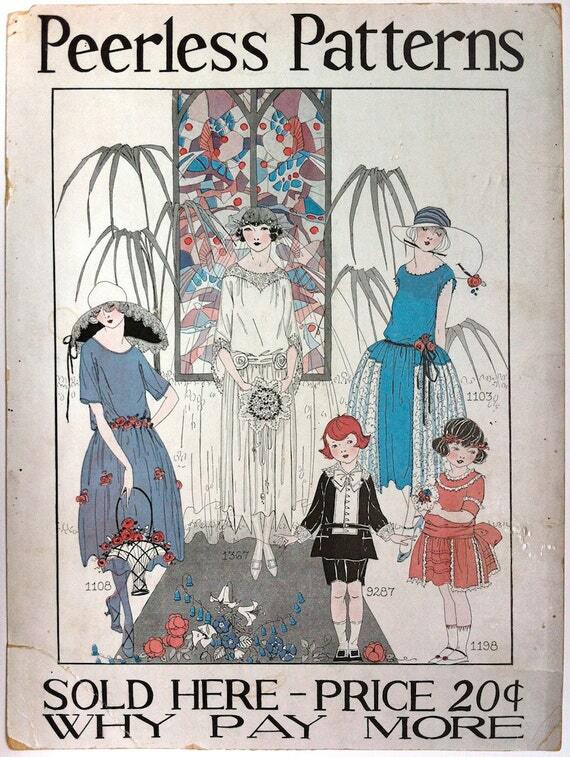 1920s Peerless Patterns advertising poster. Image: PatternVault shop. 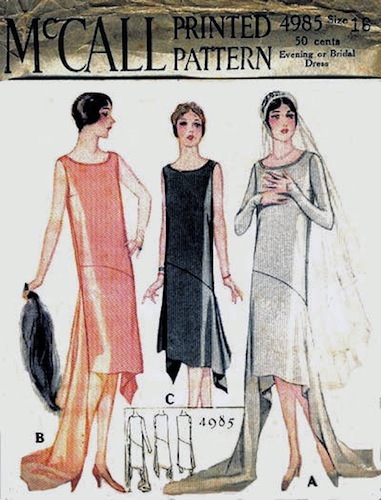 McCall 4985 (1927) Image: Commercial Pattern Archive, Kevin L. Seligman collection. For research purposes only. McCall 7852 (1934) Image: Etsy. McCall 7852 on the cover of McCall Fashion Book, Mid-Summer 1934. Image: eBay. 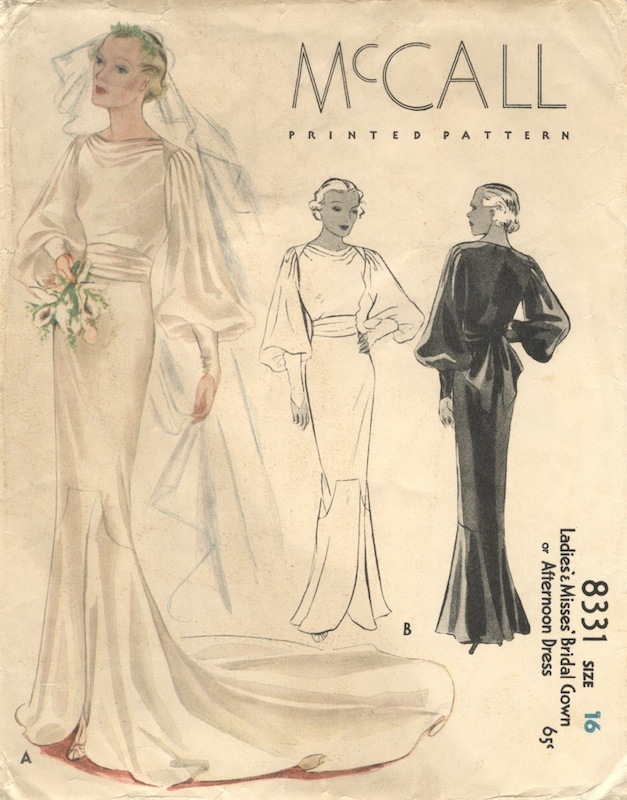 McCall 8331 (1935) Bridal gown or afternoon dress. 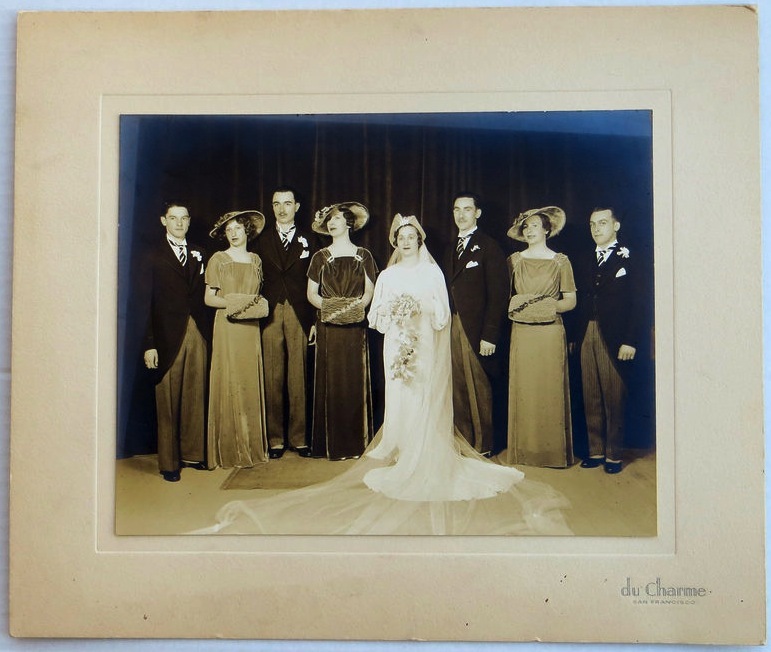 1930s wedding portrait from a San Francisco estate. Image: eBay. 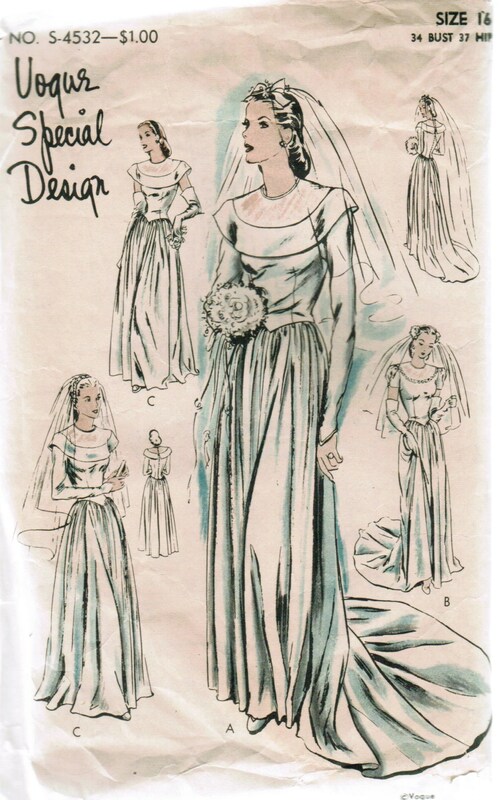 Vogue S-4532 (1944) Image: Vintage Patterns Wiki. McCall 6353 (1946) Image: Etsy. Vogue 1331 by Jacques Fath (1956) Image: carbonated on flickr. Vogue 148 by John Cavanagh (1958) Image: VADS. 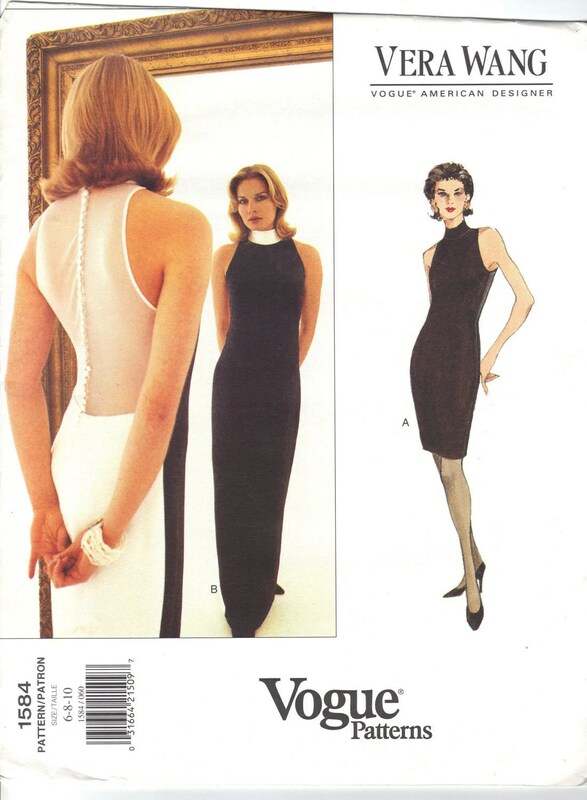 Vogue 1347 by John Cavanagh (1964) Image: Vintage Patterns Wiki. Vogue 7082 by Halston of Bergdorf Goodman (c. 1965) Image: eBay. Vogue 2520 by Pierre Cardin (1971) Image: eBay. 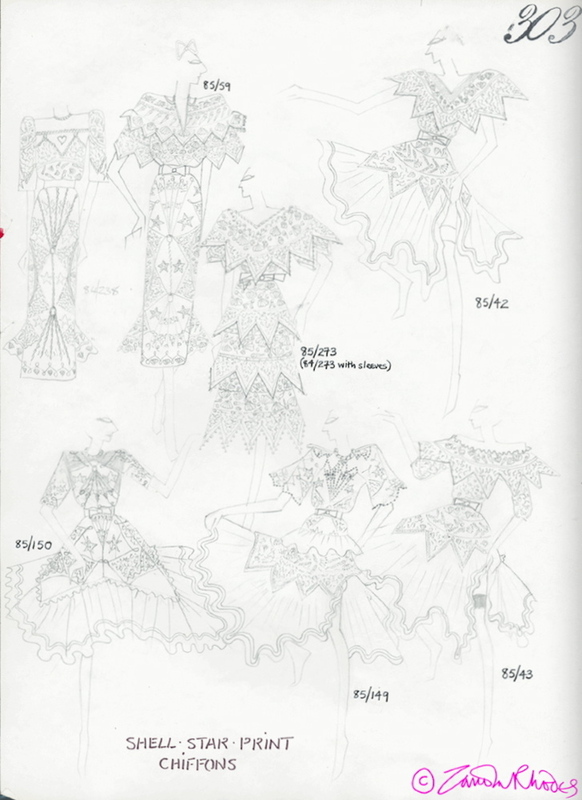 Illustration and technical drawing for Vogue 2520. Image: eBay. Vogue 1590 by Yves Saint Laurent (c. 1976) Image: Patrones Costura on Etsy. 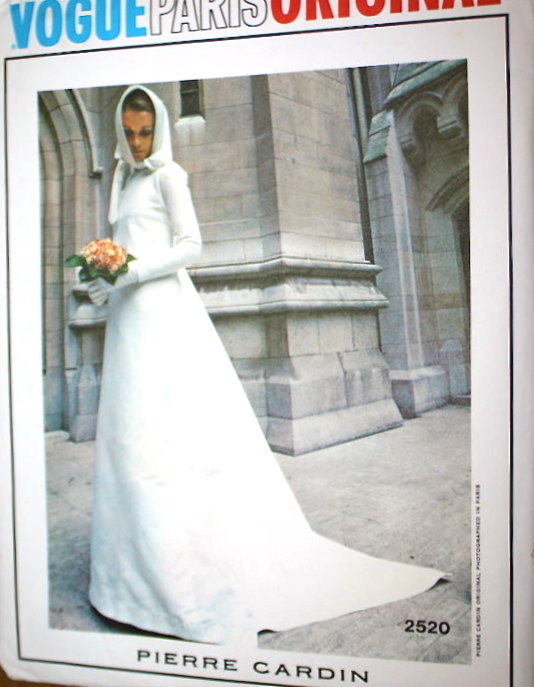 Vogue 2545 by Christian Dior (1980) Image: PatternVault shop. 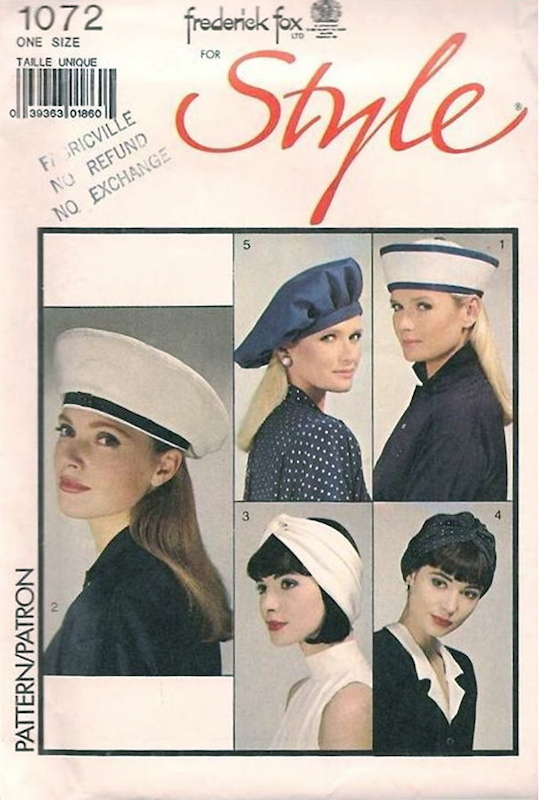 Vogue 2180 by Bellville Sassoon (1989) Image: eBay. For more on the history of bridal fashion, see the V&A Weddings page and Edwina Ehrman’s The Wedding Dress: 300 Years of Bridal Fashions (V&A, 2011). Vera Wang with Ralph Lauren at the CFDA Awards, June 3, 2013. Image: style.com. Last night Vera Wang was honoured with the CFDA’s Geoffrey Beene Lifetime Achievement Award. (Read style.com’s article here; Voguepedia bio here. Watch the awards ceremony here.) Wang, 63, has built a retail empire that began with the bridal boutique she founded in New York in 1990. Vogue Patterns magazine, May/June 1995. Image: eBay. Vogue Patterns catalogue, June 1995. Image: eBay. Vogue 1583 by Vera Wang (1995) Image: Etsy. 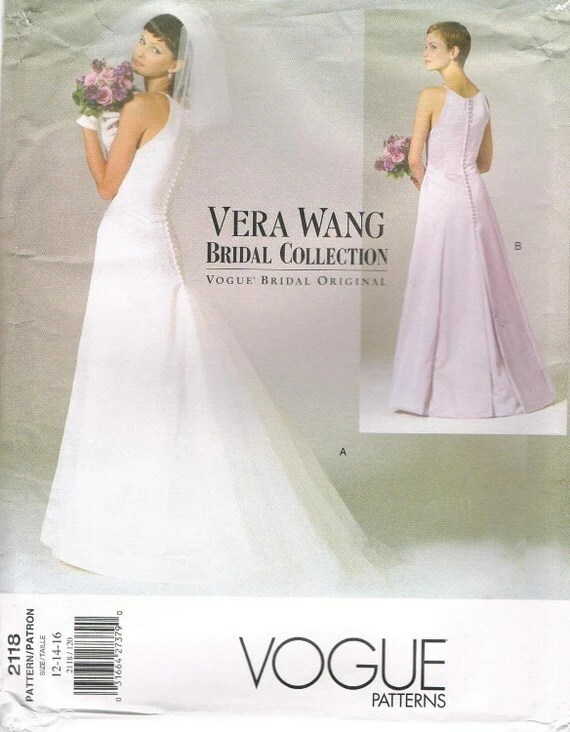 Vogue 1584 by Vera Wang (1995) Image: Etsy. 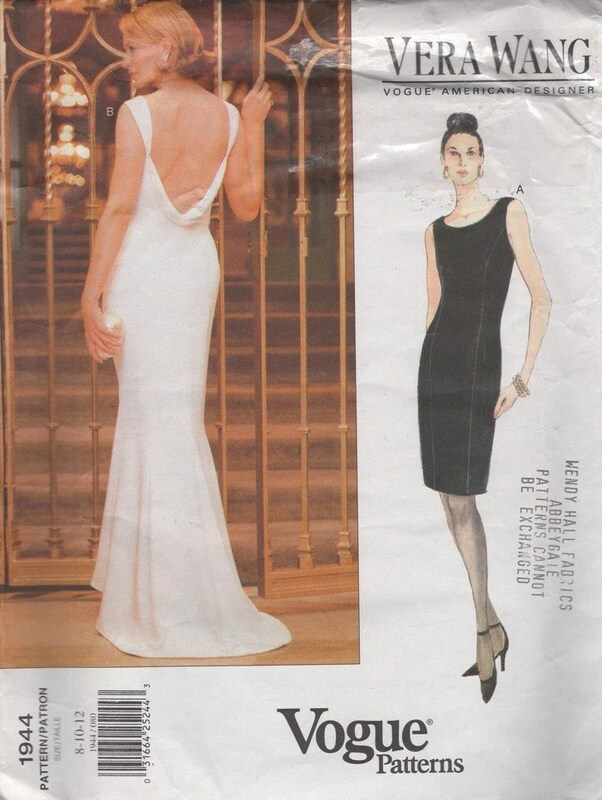 Vogue 1585 by Vera Wang (1995) Image: eBay. 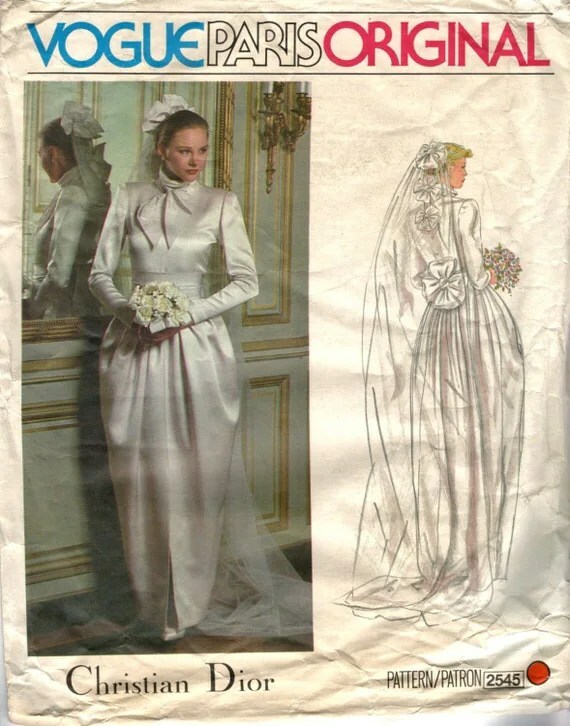 Vogue 1767 by Vera Wang (1996) Image: Etsy. 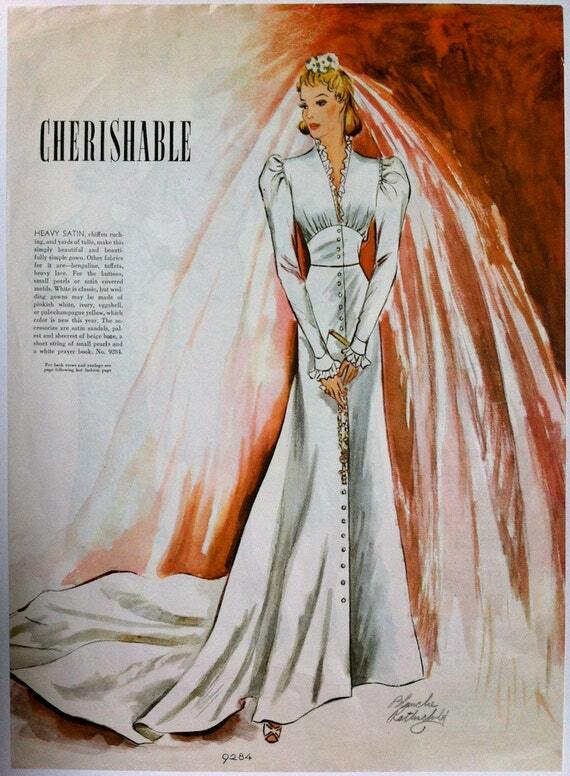 Vogue 1944 by Vera Wang (1997) Image: Etsy. 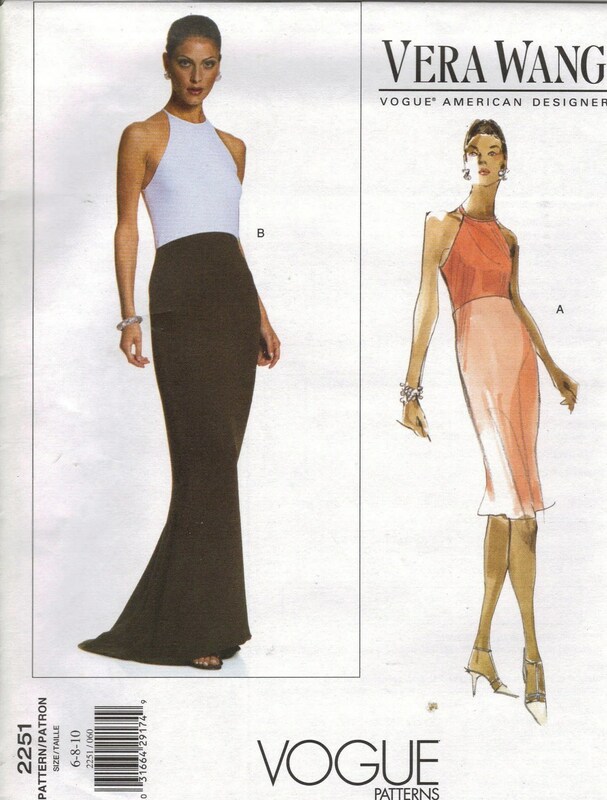 Vogue 2118 by Vera Wang (1998) Image: Etsy. Vogue 2251 by Vera Wang (1999) Image: Etsy. 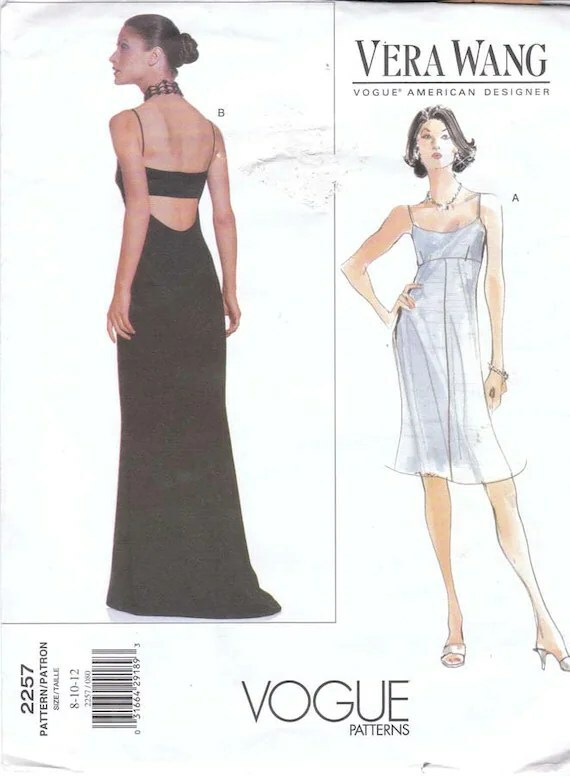 Vogue 2257 by Vera Wang (1999) Image: Etsy. This week, four milliners who licensed their designs with Vogue in the early Sixties: Sally Victor, John Frederics, Guy Laroche, and Halston. 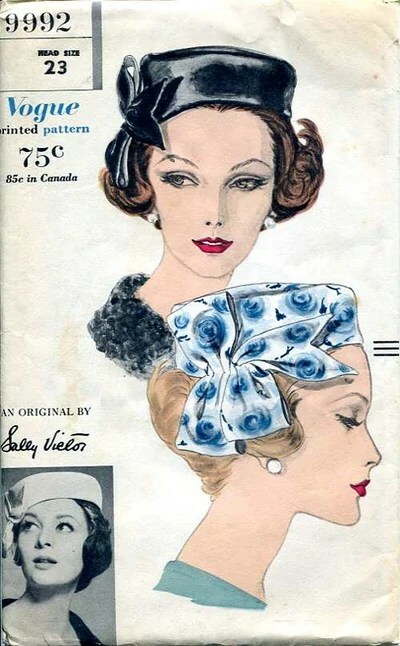 Sally Victor (1905-1977) was one of the United States’ most prominent and successful milliners. She began her career as a department store buyer in the 1920s; after her marriage to the milliner ‘Serge’ (Sergiu Victor) she turned to designing hats, first for her husband’s salon and, from 1934, at her own custom millinery studio. Victor was known for her wearable yet sophisticated designs showing a diversity of influences. Vogue 9992 by Sally Victor (c. 1960) Pillbox with bow. 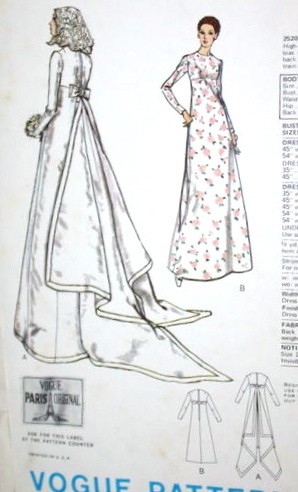 Image via the Vintage Patterns Wiki. John-Frederics was founded in 1929 by partners John P. Harberger (1902-1993) and Frederick Hirst (1906-1964). The duo designed hats for Hollywood productions including Gone With the Wind (1939), in which Vivien Leigh wore their straw hat. The label has a confusing history because of the partners’ subsequent name-changes: John P. Harberger changed his name twice, first to John Frederics and later, after the partnership dissolved in 1948, to John P. John; he designed solo as Mr. John, and Frederick Hirst as Mr. Fred. (Vogue also had Mr. John patterns in the 1950s.) It was Hirst who continued the John-Frederics label into the early 1960s. 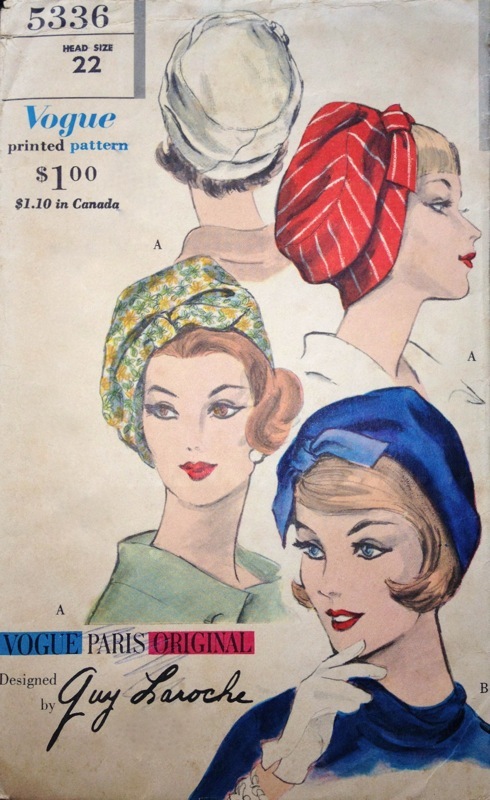 Vogue 5384 by John Frederics (1961) Toque. 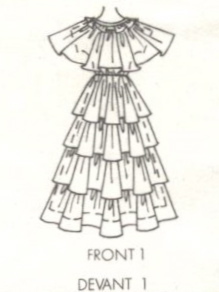 Image via the Vintage Patterns Wiki. Vogue 5336 by Guy Laroche (1961) Toque. Image via eBay. Illustration from Vogue Pattern Book, August/September 1961. Born Roy Halston Frowick, Halston (1932-1990) also started out as a millinery designer. In 1957 he opened his own hat shop in Chicago; by 1959 he had relocated to New York to design hats for Bergdorf Goodman. He achieved fame as a milliner when Jacqueline Kennedy wore his pillbox hat to John F. Kennedy’s 1961 presidential inauguration. 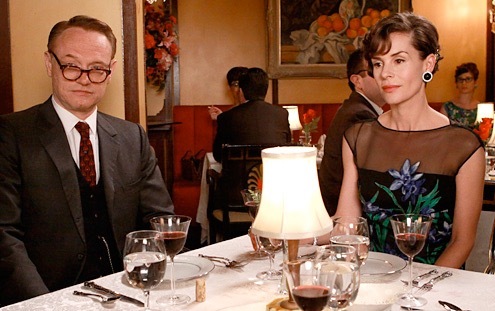 Vogue’s hat patterns refer to him as Halston of Bergdorf Goodman. 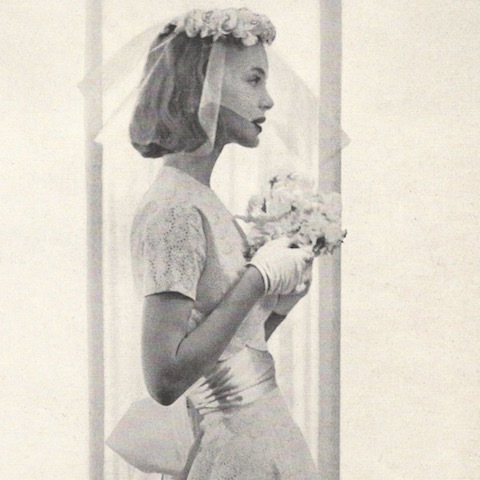 Vogue 7082 by Halston of Bergdorf Goodman (c. 1965) Bridal headpieces. Image via eBay. 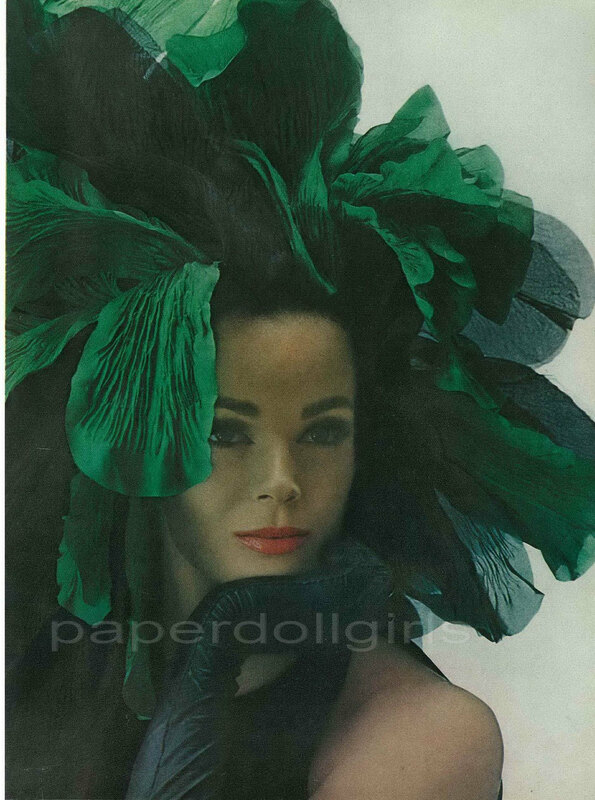 Halston headpiece, Vogue, 1 April 1963. Image via Etsy. This group of milliners, old and new, seem to reflect the fortunes of millinery in the twentieth century. By the Sixties, Sally Victor and John-Frederics were established labels run by senior designers nearing the ends of their careers, while the younger designers, Guy Laroche and Halston, were to leave millinery to focus on fashion design. Next: McCall’s New York Designers: Bill Blass, Geoffrey Beene, and Anne Klein. Born in Scotland, Ronald Paterson moved to London in 1936 to attend the Picadilly Institute of Design. After winning a fashion design contest judged by Elsa Schiaparelli, he worked briefly at a London couture house until the beginning of the Second World War. Paterson established his own house in London in 1947. Following its 1968 closure the designer turned to costume work for films including the Bond movie “The Spy Who Loved Me” (1977). Paterson was known for his tweeds and tailoring. Vogue 1302 by Ronald Paterson (1964) Dress and jacket. 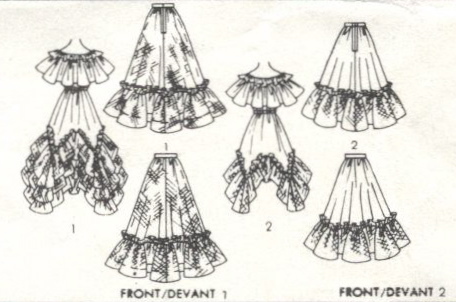 Image via the Vintage Patterns Wiki. The Irish-born John Cavanagh trained with Molyneux in London and Paris from 1932 to 1940. 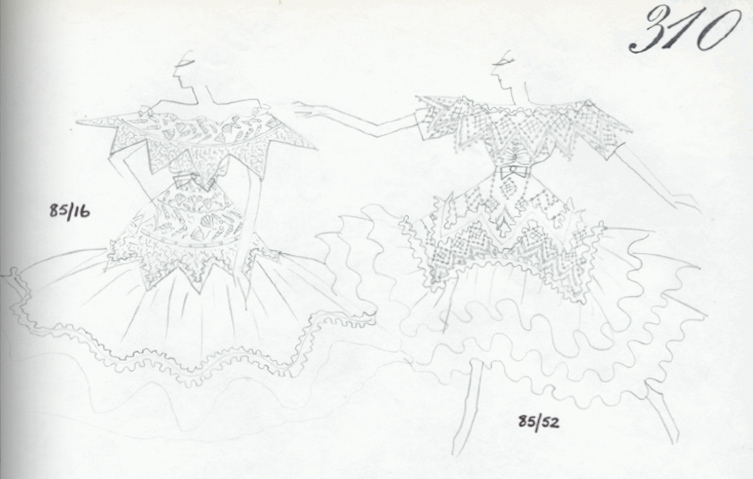 Starting in 1947 he worked as design assistant at Balmain until he established his own house in 1952. Cavanagh had an early success in his 1953 ‘Coronation’ collection, and his royal commissions included the Duchess of Kent’s wedding dress in 1961. (See photos and video of the Duke and Duchess of Kent’s wedding here.) In 1966 he shifted his focus from couture to ready-to-wear, and the house closed in 1974. Cavanagh was esteemed for his classic tailoring and evening wear. 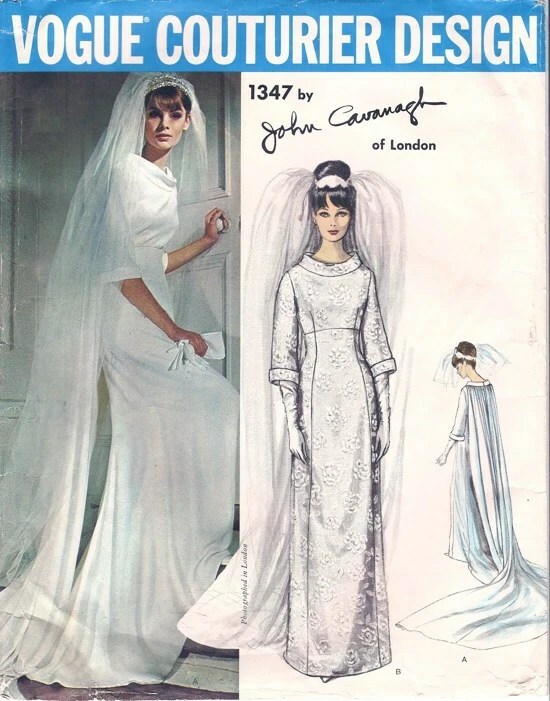 Vogue 1347 by John Cavanagh (1964) Wedding gown. 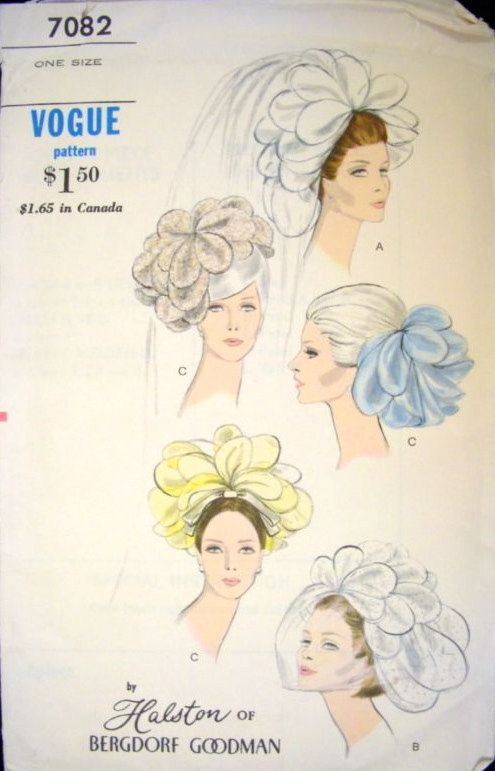 Image via the Vintage Patterns Wiki. 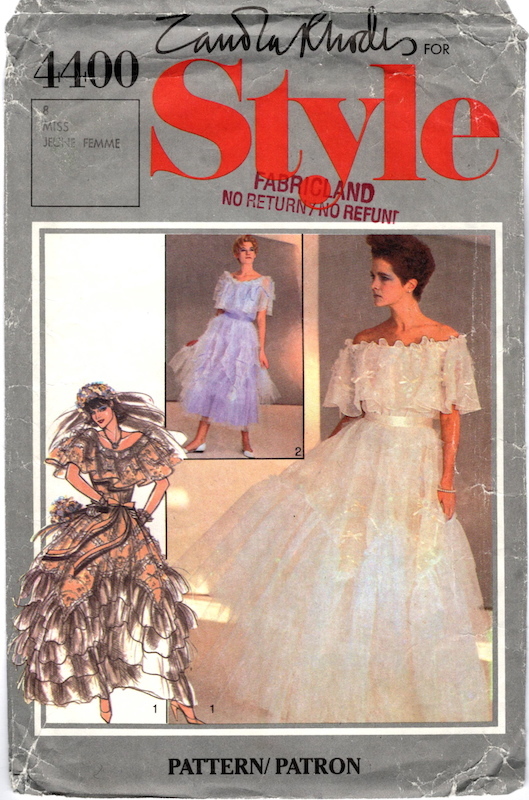 Another Irish-born designer, Michael Donéllan is called Michael of England and, later, Michael of London on Vogue patterns. From the 1940s he was head designer at the venerable London house of Lachasse before establishing his own couture house, Michael of Carlos Place, in 1953. (Carlos Place was also home to the Incorporated Society of London Fashion Designers.) 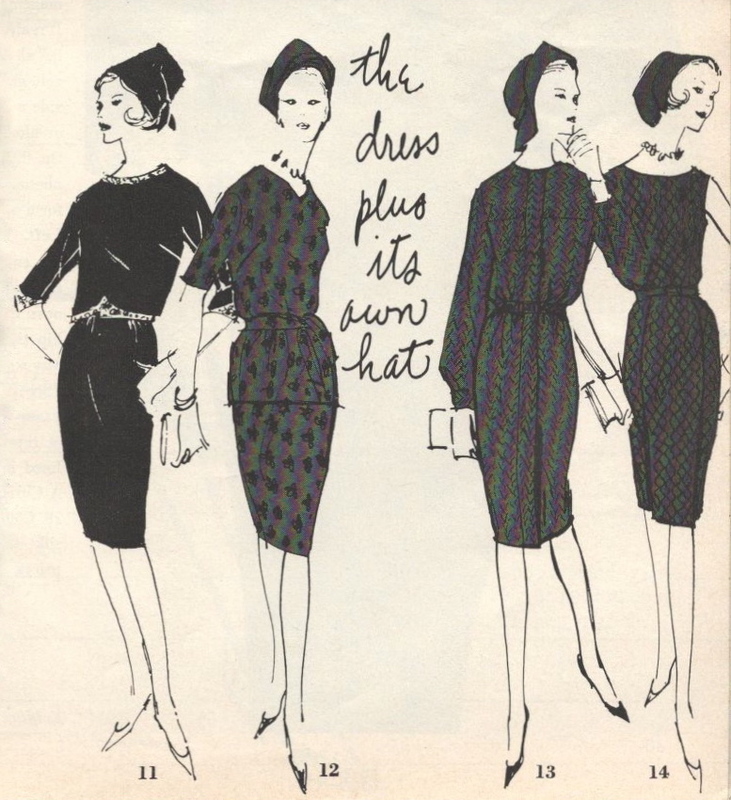 From 1961 Mr. Donéllan also worked as a design consultant for Marks & Spencer. The house closed in 1971. Michael Donéllan was called the Balenciaga of London for his elegant, uncluttered tailoring. Vogue 1437 by Michael of London (c. 1964) Evening dress and jacket. 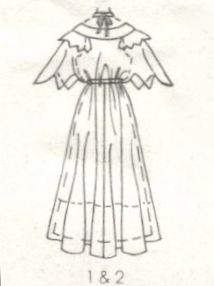 Image via the Vintage Patterns Wiki. Although Edward Molyneux is today’s most senior designer, I’ve left him to last because the house closed during the postwar period and didn’t reopen until the mid-1960s. The London-born Molyneux worked as a sketcher at Lucile from 1911 until the outbreak of the First World War. During his military service he lost an eye, and in 1917 he was made Captain, so you’ll sometimes see him referred to as Captain Molyneux. He established the house of Molyneux in Paris in 1919, moving his business to London during the Second World War. The house closed in 1950, with the Paris studio passing to Jacques Griffe; however, in 1964 Molyneux announced the relaunch of his label, presenting his first collection in early 1965. (For more on Molyneux’s comeback see Worn Through‘s recent post.) The designer retired a couple years later, leaving the business in the hands of his nephew. Molyneux’s work is famous for its spare, modern lines and understated luxury. Vogue 1502 by Molyneux (1965) Dress with ascot. 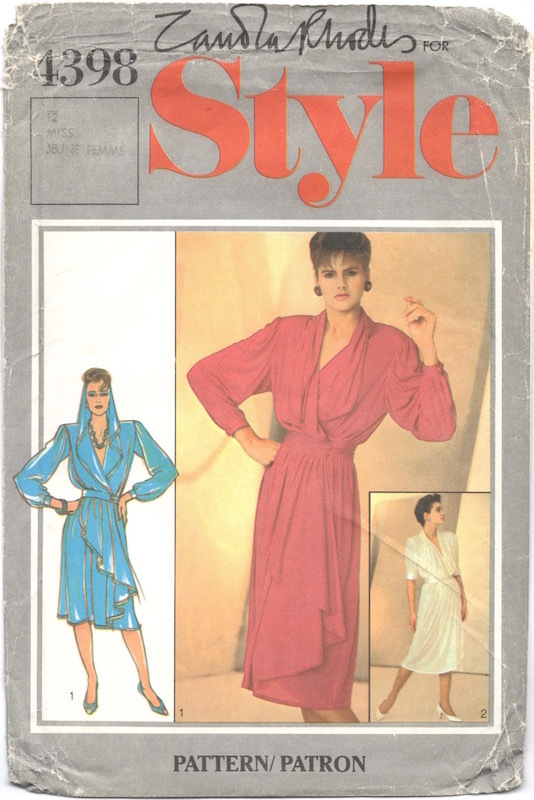 Image via the Vintage Patterns Wiki. Dress by Molyneux in navy wool crepe by Nattier, 1965. Image via VADS. Next: Old House, New Designer: Lanvin, Patou, Nina Ricci, and Dior.